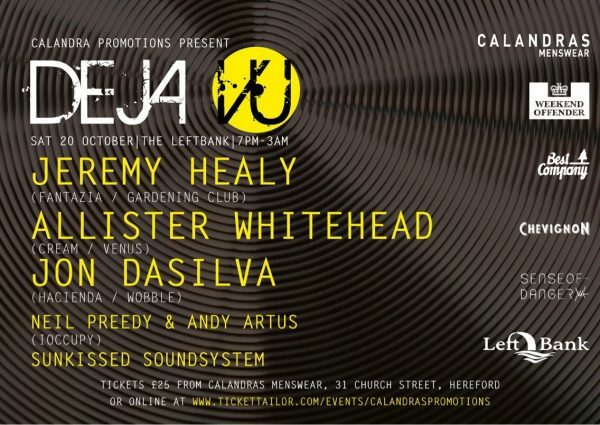 Calandra Promotions are very happy to have teamed up with the Left Bank Village this October for our debut event ‘Deja Vu’. Deja Vu brings some legends of the UK house scene to Hereford for a night of old school tunes, along with some Hereford’s own Djs to get everyone down for a little boogie. You may recognise him for his DJ appearances at top nights around the globe, or have heard of him through his sell out Fantazia compilations. It’s fair to say Healy is a icon of the scene and never disappoints. Beginning his DJ career back in 1987 Whitehead has been a staple of the UK scene ever since, he’s been a resident of Cream, Ministry Of Sound,Gatecrashers and just about every club between. One of the most influential DJs to grace the scene and a legend of The Hacienda, his balearic style has been heard worldwide and will bring something special to Deja Vu. club nights Ministry of Sound and Naughty but Nice. All fantastic talents and it is a pleasure to work with all of them to bring you Deja Vu. And paper tickets are available from Calandras Menswear. We hope to see you there, this will be a night to remember!